Efficiency in aid climbing is very much related to organization. While ascending and cleaning a pitch, rack the equipment as it will be placed on the lead rack. This greatly facilitates the lead changes. Clean protection and aid placements that are lightly set often pop out if you jug right through them. Lift up on the placement as you slide your ascender up the rope. If clean aid has been used, you can often ascend from one tying-off-short spot to the next without stopping. After tying in short again, rack the pieces that have accumulated on the rope above your ascender. This general system works even if a placement does not pop out as you move the ascenders upward. Keep the piece clipped into the climbing rope and use a chock pick and hammer to dislodge it. Once it pops free, continue ascending without reracking until you tic in short again. If, however, you must remove the upper ascender frequently, you should rack the pieces as they are removed. Fixed pins found on the route should be left in place unless they are obviously unsafe or interfere with a chock placement. Take care not to break the eyes off these old pins, leaving a useless pin. Fig. 11-29. Piton removal: a, use of "cleaner biner"; b, hammer used to pry; c, hammer swing. 1. Attach a "cleaner biner"—a carabiner no longer used for climbing—and a sling to the pin. Pull out on the sling while tapping the pin back and forth until it pops out (fig. 1 l-29a). 2. Pry out on the loose pin with the pick of the hammer, taking care not to break the hammer (fig. 11-29b). 3. 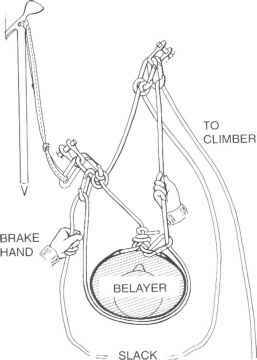 Attach a "cleaner biner" and sling to the loose pin, then attach the sling to the hammer with another carabiner. Starting with slack in the sling, swing the hammer in the direction the pin should come out (fig. 1 l-29c). Because the heads of malleable placements can only be reused a limited number of times, it is often best to leave them fixed. This is especially true if you think the wire will pull off the head as you remove the piece. If you decide to remove a malleable piece, attach a cleaner biner and sling between the head and your hammer. Then, as with pins, give the hammer a quick swing outward. It may take several swings before the head pops out. Inspect the head closely before reusing it because they deteriorate quickly. But if your attempt to remove the head merely strips the wire away, take the time to clean the head out of the rock. 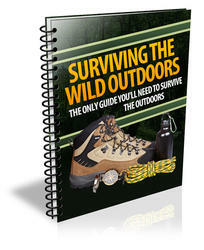 It is easier for you to do so on a fixed rope than for another climber on lead.